Have you ever wanted to play your favourite classic retro games, in real life*? Yeah, me neither, but recently I attended Light Night, a city-wide festival in Leeds, UK, where I found the Actual Reality Arcade. This project, by artist Matthew Harrison, recreates retro classic videogames such as Pac-Man, Donkey Kong and Space Invaders as small physical activities that you can attempt to complete with your friends. The arcade was full of kids playing with their parents at various interpretations of the 80's 8-bit classics. The kids may not have been able to grasp the games’ likenesses to their digital counterparts, but it didn’t matter. There were 12 games in total, including Space Invaders (as a coconut shy game with beanbags), Asteroids (with air powered rockets), a Frogger assault course, an actual Marble Madness board, a Tetris Jenga-style game, and more. The Pac-Man Maze was by far the best and I wanted to take the hat home with me. The arcade was an awesome hub for social bonding over games, and provided a lot of laughs whenever we attempted to recreate Donkey Kong and the like. I loved this attempt to utilise retro games as a basis for a fun community art project. 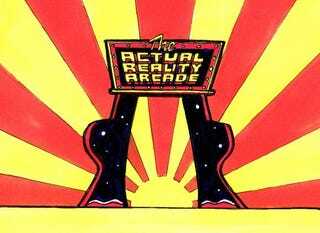 Have you seen anything like the Actual Reality Arcade before? If you could recreate one videogame as a physical like the above, which game would you choose and how would it work? Comments, ahoy! *Okay, to be pedantic, we’re always in ‘real life’ - but you get my drift.